Wrapping up the Brubeck Birthday series, I thought I’d finish with what I consider to be the Brubeck Quartet’s best live album and one of the best live jazz albums of the 20th century. High praise, I know. Let’s jump to the music then! À la musique! Mercy. The music on this album… Mercy. Everything about this album, from the liner notes to the music itself is remarkable. 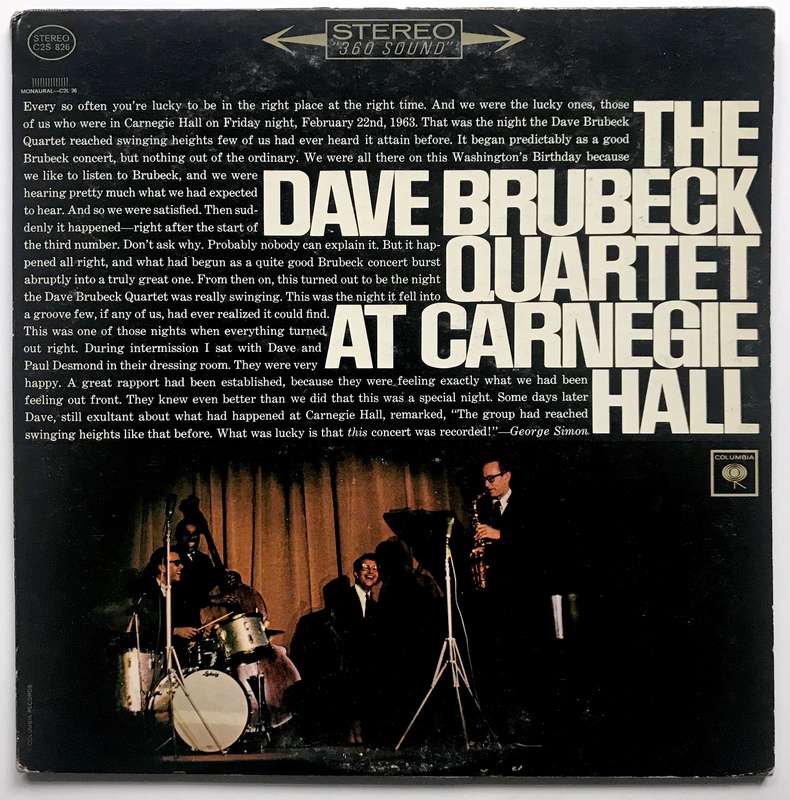 This double-LP album contains the entire concert the Dave Brubeck Quartet performed that Friday night in Carnegie Hall, from the opening intro to Brubeck’s call for an intermission to Brubeck’s ending comments at the end of the concert. It’s as close as you can get to actually going to a Brubeck concert in the 1960’s without actually jumping in a time machine and going to a Brubeck concert in the 1960’s. That by itself is an impressive quality of this album, but is not the sole reason why this album is phenomenal. To paraphrase the cover liner notes (cover notes? ), while the concert started off well, something happened during the third number that abruptly turned the concert from a good one into a great one. The material that the Brubeck Quartet played wasn’t unusual. They opened with their standard concert opener, “St. Louis Blues”, played a few things from their recent albums, did a couple of standards, and ended with “Take Five” as an encore. But the WAY the guys played the tunes was quite remarkable. Inspired by a particular note that Eugene Wright played coming out of his bass solo, Brubeck proceeds to build the majority of his solo on that unusual note. Pretty soon Brubeck’s in two different keys at the same time, making for an unorthodox exploration of the blues and making for a refreshing change when he finally releases the tension and swings back into the home key. The second tune, “Bossa Nova USA”, pronounced by Brubeck as “bASSa nova”, is an original by Brubeck. The third tune is where the magic happens. “For All We Know” was a favorite of Desmond’s, and he solos beautifully over it. He got the sparks going. Brubeck’s solo is where the sparks turned into a fire. Brubeck revisits the same note that he was fascinated by in the blues (an E natural), toying with it in a Monkish kind of way. He builds to an orchestral finish while the bass and drums at first drop to the background and then build right on with him. “Pennies From Heaven” is fun and features one of Desmond’s best solos. Brubeck played an improvised intro that masked the actual song, leaving the guys unsure of what was happening until he actually played the melody. Near the end of Desmond’s first chorus, he casually throws Brubeck’s masked intro his solo in such a way that seems 100% logical and 100% not a put-on. The rest of the concert flowed in the same way, with the guys completely inspired and on fire the entire time. Everyone gets a chance to be in the spotlight, with Wright’s bass getting a feature on “King For A Day” and Morello rising to stupendous heights on “Castillian Drums”. It’s quite possibly the greatest drum solo ever recorded, all 13 minutes of it. The ovation that Morello gets is raucous and lengthy, and it would seem impossible to play anything else after a performance as great as that. But the Brubeck Four do it, and top it. Enter the spotlighted track above. “Blue Rondo a la Turk” was the opening track on Brubeck’s hit album ‘Time Out’ and was pretty complex for a jazz tune. Even its name was a complex pun. Long story short: There’s the Mozart tune “Rondo alla Turca”, based on Turkish music or Turkish dances. Brubeck, inspired by his 1958 tour of Turkey, wrote a rondo in the Turkish 9/8 time signature (think of it as “taco-taco-taco-burrito, taco-taco-taco-burrito”), threw a blues in the middle, and named it “Blue Rondo a la Turk”. It was an actual rondo in the classical sense, too. You clever man, Brubeck you. Perhaps still on a euphoric high and feeding off the fever pitch established by Morello’s wild performance, Brubeck sets the tempo of “Blue Rondo” at an all-time high. The guys make it through the arrangement, and after alternating 9/8 with 4/4, the band starts to cook. Brubeck lays out while Wright walks the bass and Morello keeps time, freeing Desmond to really play. And play he does. Blowing chorus after tasty chorus, Desmond provides a textbook example of how to logically build a blues solo. It culminates in a series of nasty phrases with extremely high notes in the upper register of Desmond’s horn followed with a bluesy conclusion. Nasty yet delicious. If Desmond’s solo was a textbook example of solo building, Brubeck’s ensuing solo is the Golden Rule in terms of how to not only build a solo but how a band as a whole should build slowly with the soloist and listen at all times. Brubeck at first plays some full, thundering block chords as the applause for Desmond dies down, carrying the momentum of his solo into his own. Pretty soon, though, Brubeck dials it back a few notches and starts to play with single notes with a quiet statement with his left hand as needed. He then builds from this to a more muscular support from his left hand while playing with octaves in his right hand. Meanwhile, Morello lays down the metronome with rimshots and Wright walks the bass with a no-nonsense attitude. As Brubeck transitions to full block chords, the energy is turned up even more, and soon Brubeck nudges Morello into double-time. Now in double-time, Brubeck, with Morello’s help, builds to a tremendous climax and the audience goes wild, understandably. I was standing up in my room when I first heard it. Absolutely nuts. As an encore (they really thought they could get away after that), they honor the many calls from the audience and launch into a very fast “Take Five”. Perhaps it’s due to said tempo, but this version of “Take Five” is different from the numerous versions out there, with Desmond sounding particularly searching and plaintive while Brubeck’s solo follows in the same vein. Yes, this is one of Dave Brubeck’s greatest albums of all time, and certainly better than ‘Time Out’. You can hear the improvisation, the chance-taking, and the spontaneity taking place- all the ingredients needed for good jazz. What a great use of space. What a great use of color. And a relatively rare picture of the group in color? Too cool. The use of putting a tantalizing lead-in to the music on the cover is fantastic, as it makes you want to 1.) listen to the music and 2.) want to open the album and read the rest of liner notes. The white lettering against the black background is easy on the eyes, and the layout of the title is aesthetically pleasing. 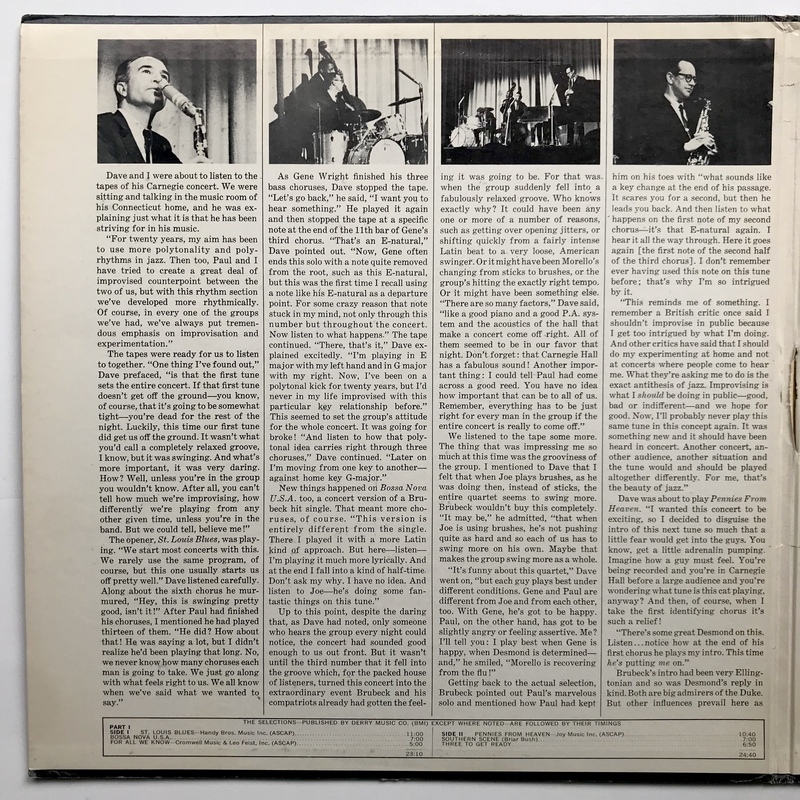 This album is a rare example of Columbia gate-fold album, and even rarer example of such an album having extensive liner notes AND photographs. To be honest, these liner notes were 60% of the reason why I bought this album on vinyl. They’re fascinating and extremely insightful. 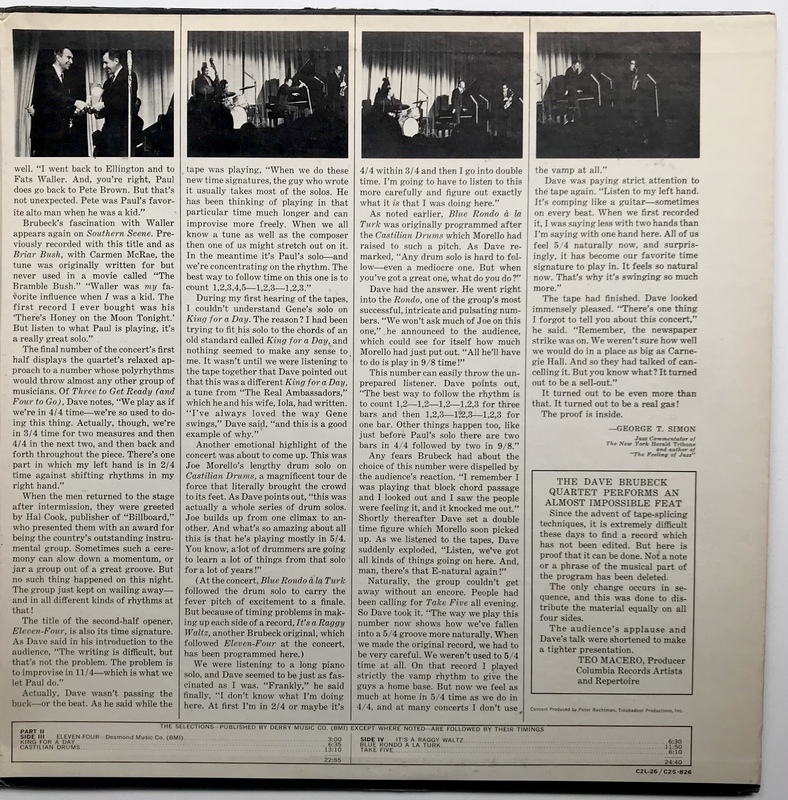 Written by critic George Simon, the liners are basically the conversation Simon had with Brubeck while Brubeck played the tapes, with Brubeck commenting and explaining what was happening as needed. It’s a behind-the-scenes kind of conversation. The pictures are nice, although one wishes the photographer could’ve gotten closer. Something I noticed is that the picture on the cover wasn’t taken at the same concert as the one on the record. Just another bit of trivia. The record labels are interesting for a few reasons. For starters, there’s the obvious difference in physical labels. The first record is a redish/orange color and has the ‘360 STEREO’ in black type, lacking the arrows. The second record in the album however is more strawberry red and has the ‘360 STEREO’ in white type with the arrows. I’m not sure why the difference in labels on the same album, but both label variants were allegedly in use by Columbia simultaneously in 1963 when this album was pressed. It’s rather confusing in terms of trying to pin the provenance of an album down to a time-frame. Checking my Columbia albums from the 1960’s revealed conflicting results. Most of the albums released between 1963 and 1965 had the black type, but one or two had the white type and one didn’t have the ‘360 SOUND’ thing at all. It all leads me to believe that… I don’t know what Columbia was doing. Earth-shattering discoveries like these are the reason why you all read my blog, I know. If you want to try and make sense out of it all, head on over to the great LJC’s website and have a ball! Another interesting thing about the labels is that they have both the catalog codes for the records as they appear in this double-LP album and as they appeared on their own in seperate albums released as part one and part two. Columbia may have been a major record company, but they still saved money and ink by using the same labels. After all, how do you think they became a major record label? Here’s another album bought off of eBay, and it was a grand reminder of why I try to avoid buying online. This record was an auction item, promising new mint condition vinyl. The price started off fair enough, so I bid for it. I won after a bit of last-minute activity, paying $8 for it before shipping. It was coming from New York, so no big deal. That was on December 15 of 2018. I didn’t actually receive the record in the mail until January 8. Why did it go from New York down to Florida and then up to Georgia? Why did it take nearly a month to make that trip? Why didn’t it play like a new mint record when I finally played it? Why do I keep buying records on eBay? The world will never know.